A lot of people are asking how to take measurements and make 3D models from 2D images. If conditions are juuusst right, SketchUp’s Match Photo technique is the way to go. Unfortunately, in our world, conditions are almost never just right, unless you happen to be able to take the photo yourself. Here’s an alternative method using Web Plot Digitizer, which is still free and can scale for as much (or as little) information as you have (keeping in mind a larger margin of error). 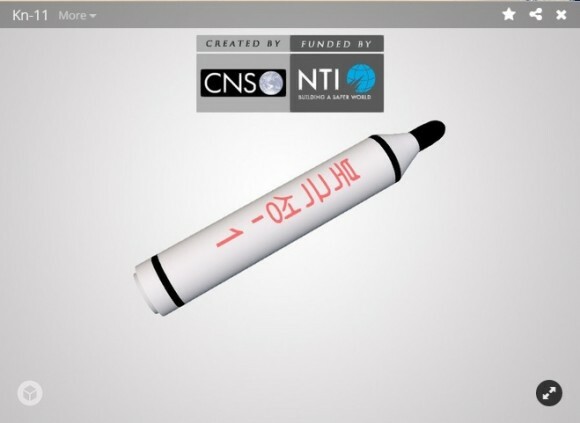 A few days ago the DPRK’s state news agency, KCNA released the first images of North Korea’s new submarine launched ballistic missile (SLBM). 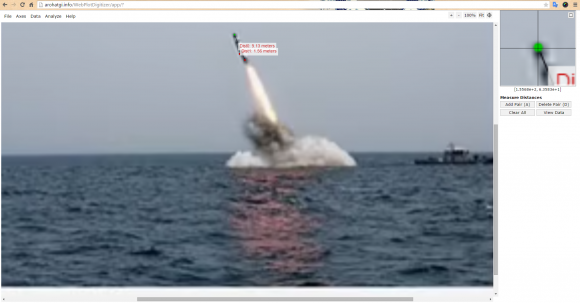 These photos we’re great, but with just sky and water, there wasn’t much context about the size of the missile. BOOM! and, we were off running (well, typing furiously on a JFK-> SFO flight). Surprise! That carefully crafted message of Kim Jong Un hanging on his yacht smoking a cigarette and watching a missile launch from a submarine? Not so much. Turns out they start off launching from an underwater platform just like the rest of us. Dave already took care for that for us. It’s in Sinpo! 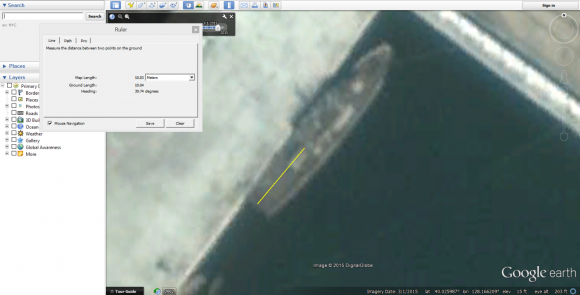 (40.026008°, 128.166174°) Using the measurement tool in Google Earth, we can see that from stern to cabin, the ship is about ~10.03 meters. 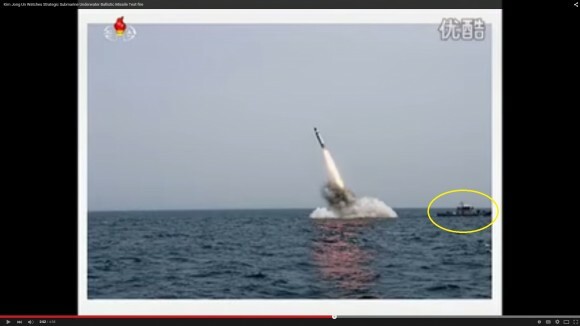 Load in the very best screen shot you can muster from the YouTube video which shows both the missile and the ship. Next, choose the “Map With Scale Bar” option, and hit “Align Axes.” So… we don’t actually have a map with a scale bar, but we are going to simulate one. And, because the entire ship isn’t in the image, we are going to use the distance from the stern to the cabin as our scale. Zoom in as much as is comfortable, and use the window in the top right to place your points. You can adjust them as needed. I measured along the top of the water to keep things level. When ready, click “Complete!” and enter the units. I measured 10.03 meters on Google Earth, so that’s what I put in. I did this several times, and got slightly different measurements, but they were all around 9 meters long with 1.5 diameter. There is a kind of faint halo that forms around the missile, and I tended to discount it in the measurements. I’d be interested to see what measurements others get, so that maybe we could average them. This rough estimate makes it seem like they are working from an R-27. 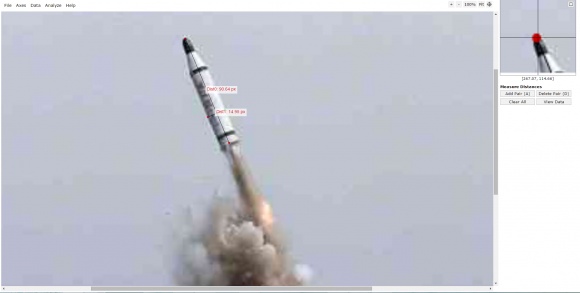 Using a higher resolution image of the missile (which, unfortunately, doesn’t have the ship for scale) I got a ratio of 90.64 to 14.95 pixels. First and foremost, these aren’t very high res images. And, taking a screenshot of a YouTube video of a still image, is kind of scraping the bottom of the barrel. A pixel here and a pixel there on a low resolution image can add up. On top of that, we don’t know the distance or heading of either the ship or the missile relative to the camera or each other, which causes a greater margin of error. Another fantastic research assistant, Bo Kim, will write up a more detailed account of how to use this process to measure Iranian centrifuges taking into account their angle relative to the camera. STAY TUNED! Ya, well nice demonstration. But what makes me wondering: why de hack does North Korea built rocked propelled giant pencils?? ?